Today begins a nine day NOAA research cruise on NOAA ship Bell M. Shimada. Presently, we’re docked in San Francisco and will head out the gate at 0900 tomorrow. 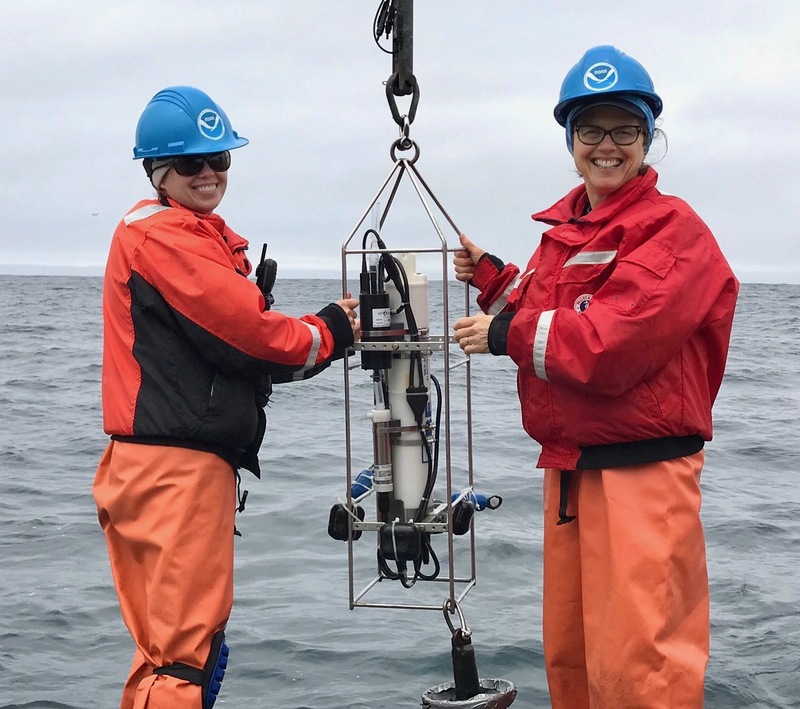 I’m really excited to be part of a team of 12 scientists and specialists conducting research in the Greater Farallones and Cordell Bank National Marine Sanctuaries. I plan to blog often (connectivity permitting) throughout the journey and to share the details of our work. It’s a delight and an honor to be part of the ACCESS research team on NOAA ship Bell M. Shimada. I really enjoyed getting to know all the students, interns and young scientists on board the Fulmar. It was inspiring to learn about what they are studying in their programs at San Francisco State University, University of California at Davis (Bodega Marine Lab), and Sonoma State University. 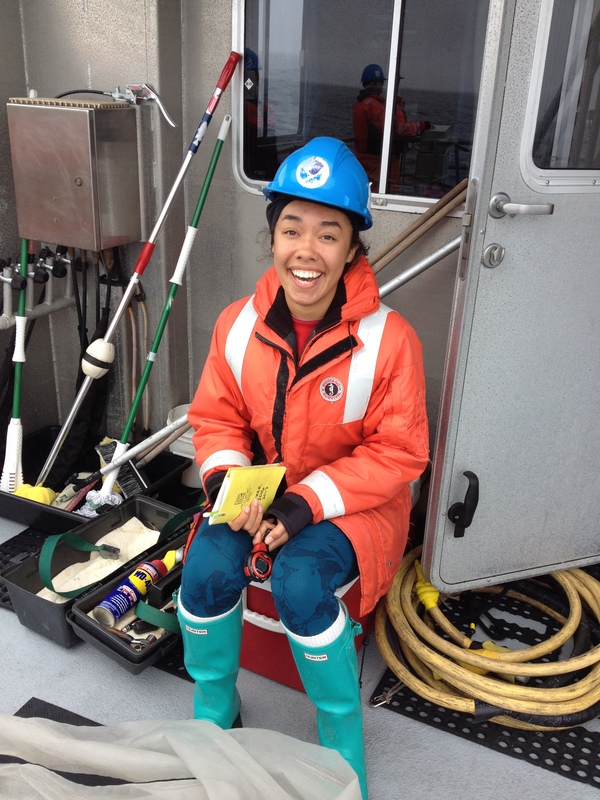 Carina Fish studies geochemistry and paleooceanography as she pursues a PhD in Geology at UC Davis. 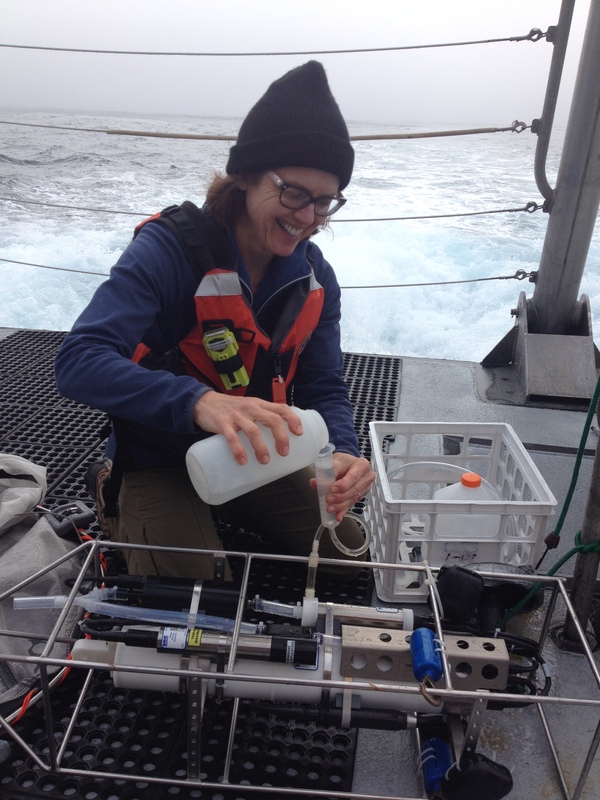 She is involved in Carbon 14 dating of deep sea corals at the edge of the Cordell Bank. 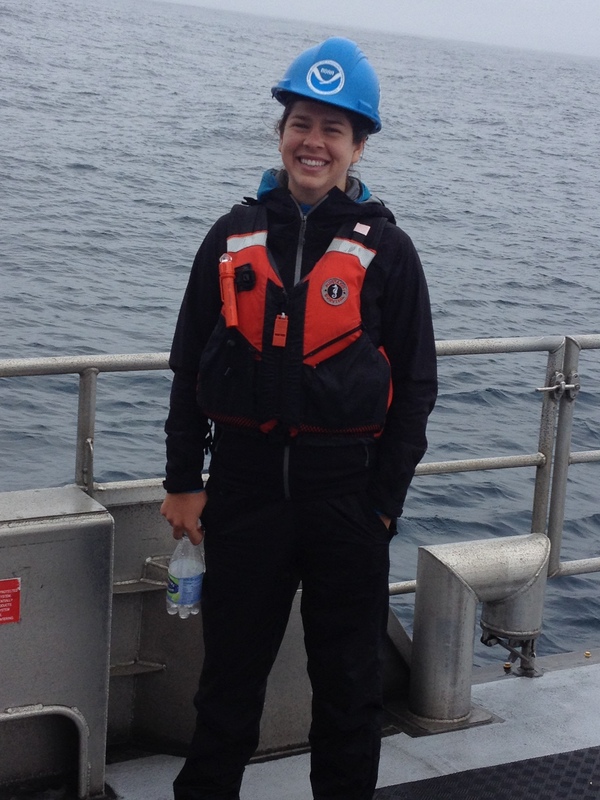 Hannah Palmer (Bodega Marine Lab) is a PhD student at UC Davis studying ocean change in the past, present and future. 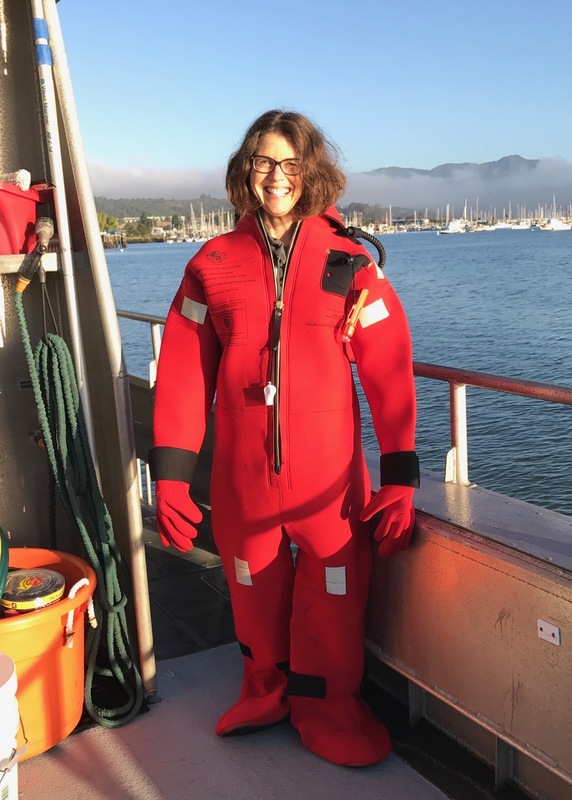 Kaytlin Ingman studies ecology and marine biology in her graduate program at San Francisco State. Kate Hewett (BML) got her BA and MA in mechanical engineering, and now is working on a PhD in marine science at UC Davis. 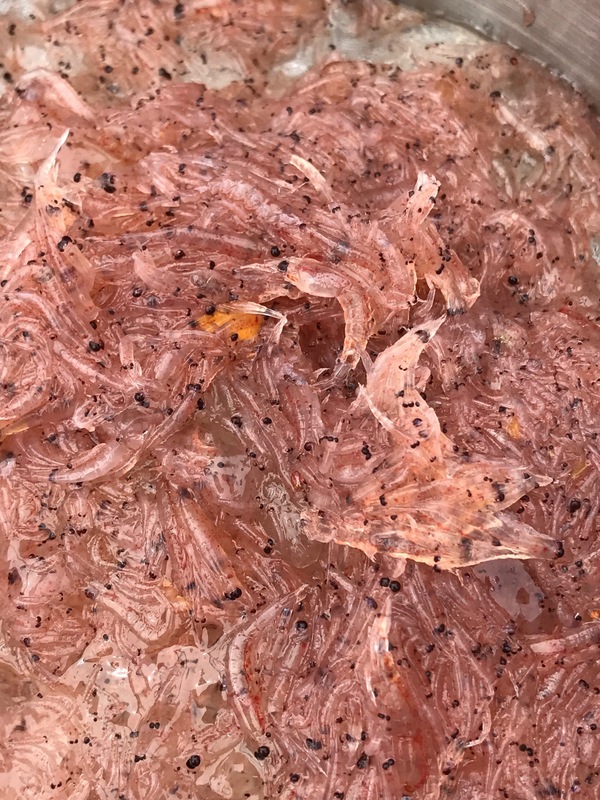 Sarayu Ramnath and Liz Max conduct experiments on krill at Point Blue Conservation Science and demonstrate their craft at the Exploratorium once a month. Emily Sperou studies marine science at Sonoma State. All these people brought great energy to the mission on board the Fulmar. It’s clear that the senior scientists really enjoyed teaching and mentoring them. 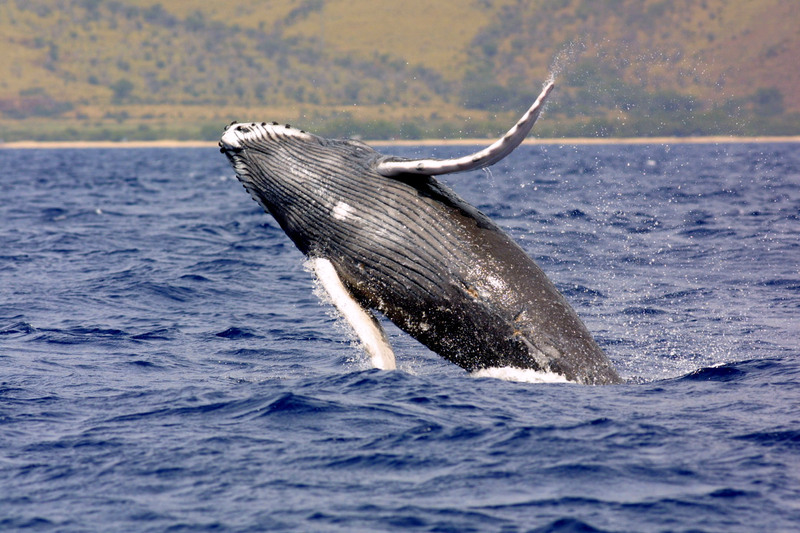 Why do whales breach? Some hypotheses include that whales breach to shed parasites, slough skin, communicate within their species, exhibit reproductive behavior or just for fun. The consensus within the scientific community is that whales breach to communicate with other whales. 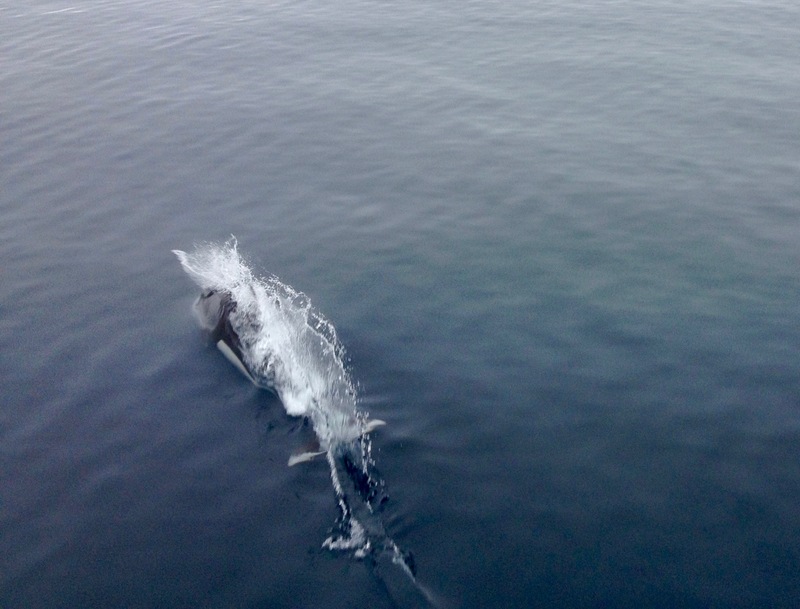 It’s pretty obvious that the CA sea lion we saw leaping and twisting as he swam behind the boat was enjoying himself surfing the stern wave, but what about porpoises swimming in front of the boat? The ship’s wake also pushes them forward so they can easily surf the water. They like to surf the bow wave – fun, fun, fun! Ocean sunfish (mola mola) This giant fish lives on a diet that consists mainly of jellyfish. When exploring the coast, you should keep a 100 meter distance from marine mammals. If the animal appears stressed you are too close. Well, it’s true. I’ve been home now for 3 days and it still feels like I’m bobbing on the ocean! Kirsten called this “dock rock” and I can see why. I came into this hoping I would see whales, and I did! I was thrilled to see humpback and blue whales, whale flukes, and CA sea lions and Dall’s porpoises surfing the boat’s wake! I gained a much deeper understanding of the ecosystem monitoring being done and how it’s important for the management and preservation of species. I appreciate the professionalism and collegiality among the scientists. It inspires me to build coalitions among the school system, scientists and community partners to advance ocean literacy. And finally, I have great respect for the hard work involved in being on the ocean. Thank you for teaching me how to assist in conducting the research, and including me in the group. It was fun getting to know you and I look forward to staying in touch as I bring this experience back to the classroom. I am doing a lot of thinking about bringing marine science careers back to the classroom. I loved hearing from you. Thanks for posting your comments! 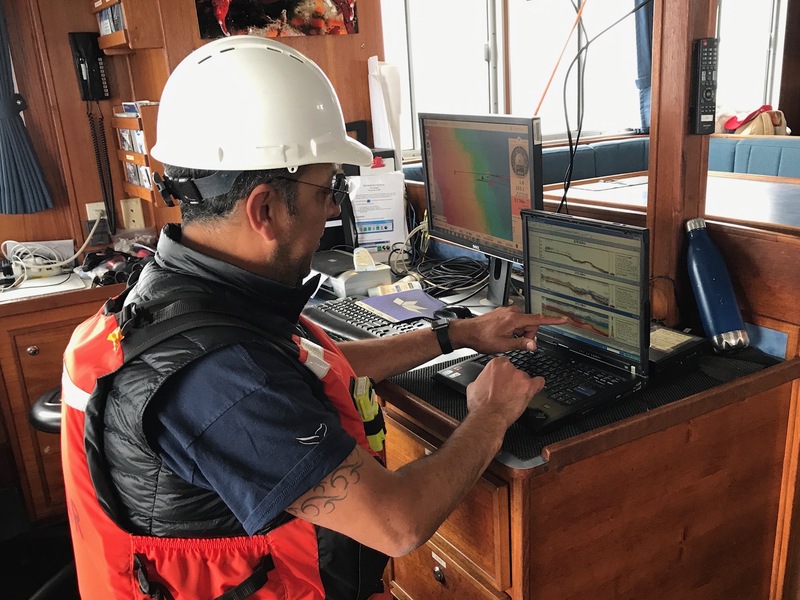 As I described in another blog, the ACCESS cruise records data about top-level predators, plankton, and environmental conditions as indicators of ecosystem health. Today I’ll explain sampling of plankton and environmental conditions. There are two methods of collecting plankton. 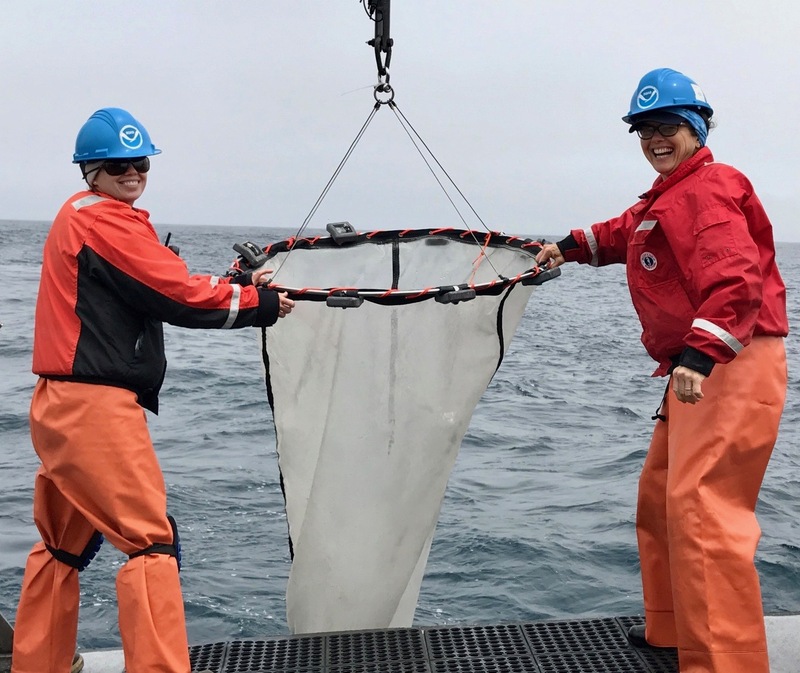 The Tucker Trawl, a large net with 3 levels is used to sample organisms that live in deep water (200 meters or more) just beyond the continental shelf. 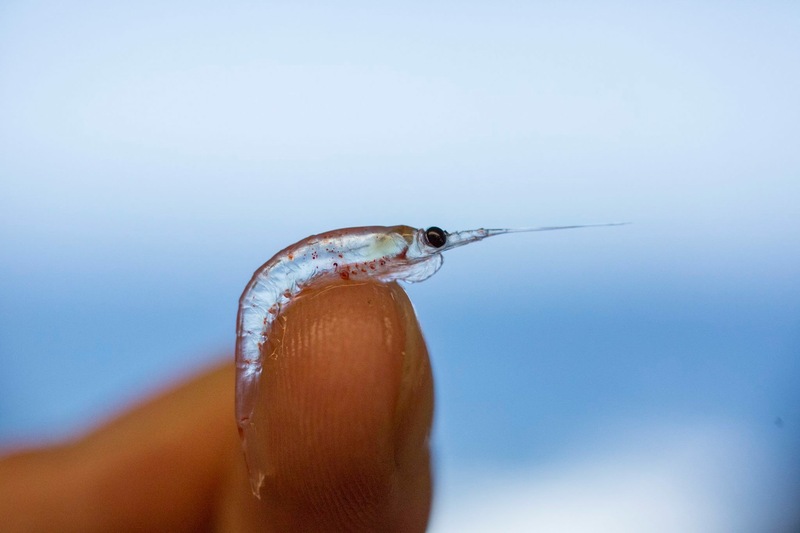 The collected krill and plankton are sent to a lab for identification and counting. 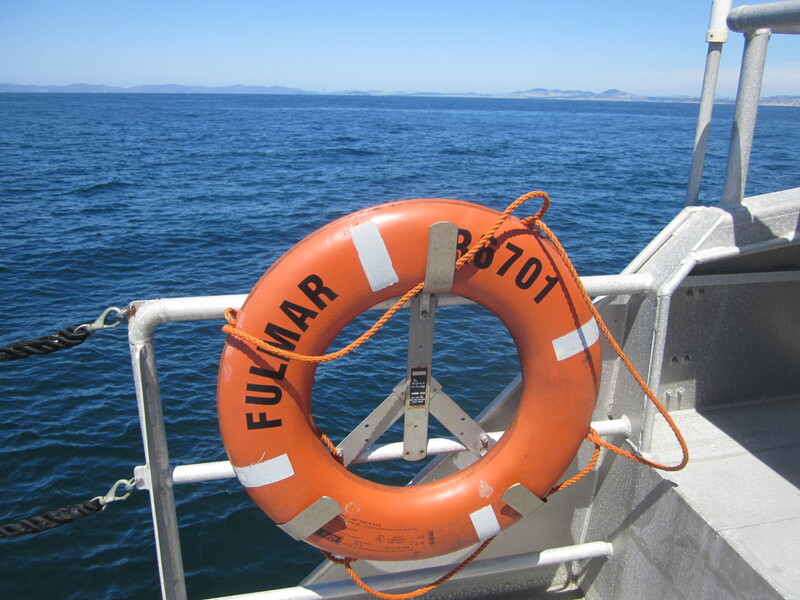 Another method of sampling producers and organisms is the hoop net, deployed to within 50 meters of the surface. Environmental conditions are sampled using the Conductivity, Temperature and Depth (CTD) device. It measures conductivity (salinity) of the water, temperature and depth. The CTD is deployed multiple times along one transect line. Nutrients and phytoplankton are also sampled using a net at the surface of the water. I interviewed several scientists and crew who help make this happen. The many aspects of the ocean we sample give a good picture of ecosystem health. It affects our management of National Marine Sanctuaries in events such as ship strikes, harmful algal blooms and ocean acidification. I like the variety of the work. I get to collaborate with other scientists, and see the whole project from start to finish. I spend 4 – 5 weeks at sea each year. The rest of the time I’m in the Cordell Bank National Marine Sanctuary office. In high school I was fascinated with understanding why biological things are the way they are in the world. There are some amazing life forms and adaptations. How did you become interested in communicating about science? I want to make a difference in the world by applying science. What’s at the top of your recommended reading list for a young person exploring ocean or science career options? We protect wildlife and ecosystems through science and outreach partnerships. -being outside in nature and working with people who appreciate what I do. When did you know you wanted to pursue a career in science or an ocean Science? I always wanted a career in marine science. The NOAA Commissioned Officer Corps (NOAA Corps) is a uniformed service of the United States which provides professionals trained in sciences and engineering. 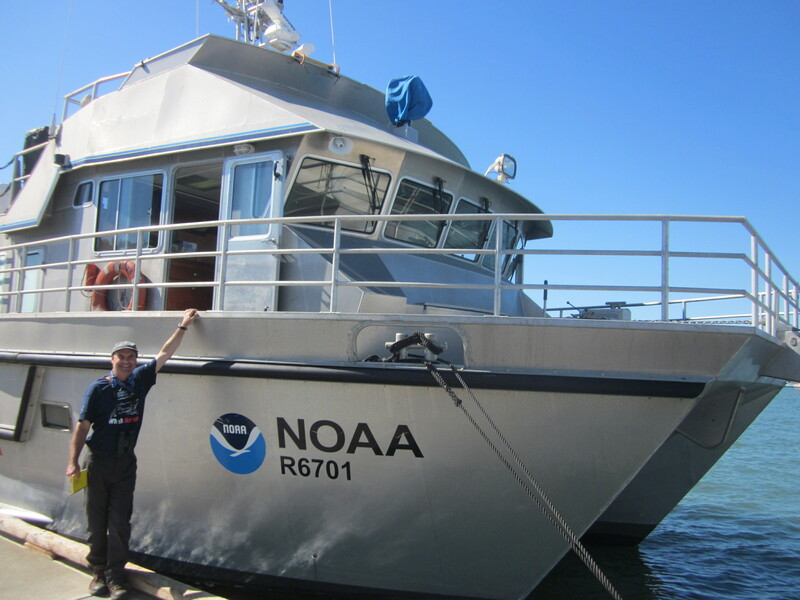 Brian has been working for the NOAA Corps for 3 years. He is responsible for the ship while on watch, and other duties such as safety officer. Among other duties, I drive the ship and operate the winch to deploy the trawl and CTD. I’m based out of Monterey, and spend 60 – 90 days per year at sea. I spend 40 hours / week maintaining the boat. -the Vessel Inventory Management System, which is a maintenance program. In the summer of eighth grade I went to visit relatives in Germany. It was my first time in the ocean. I also spent 15 days in the San Juan Islands. Brian is responsible for safety aboard ship and it is a high priority. 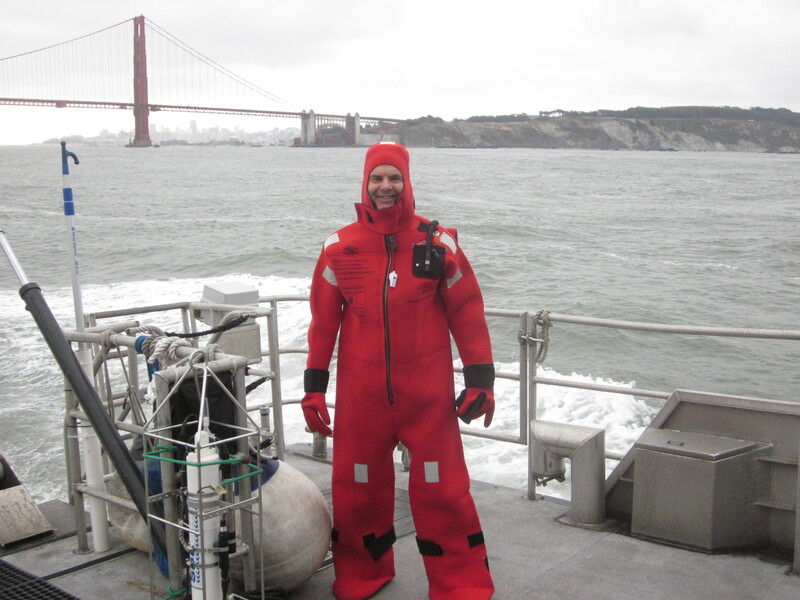 Before sailing I had to do an immersion suit drill where I put on a heavy neoprene suit in 3 minutes. When on deck everyone wears wear a Personal Flotation Device (PFD), which could be a “float coat” or a “work vest”. A “float coat” looks like a giant orange parka with flotation built in. A “work vest” is a life vest. If you are working on the back deck when the winch line is under tension, you must wear a hard hat. Most people wear waterproof pants and boots to stay dry when hosing down nets. A blue whale spout has the general shape of a fire hydrant, and a humpback whale spout looks more like a fan. I suppose you are wondering what I do in my free time. Between my tasks on board, eating, and blogging, I am pretty busy. Getting extra rest is a big deal, because it’s hard work just to keep your balance on a ship. Some evenings, I feel like I have been skiing all day long! I spend a lot of my time on the flying bridge watching wildlife through my binoculars, or chatting with the scientists and crew. It is fabulous to be out here on the ocean. Watching several Dall’s Porpoises surfing the wake in front of the bow! Why do porpoises swim in front of the boat? I love hearing from you. Keep those comments coming! First Cue (The first thing you saw – either splash, spout, or body) . Method (How did you see it? – by eye, binoculars, etc.) . Observer Code (Each scientist has a number). 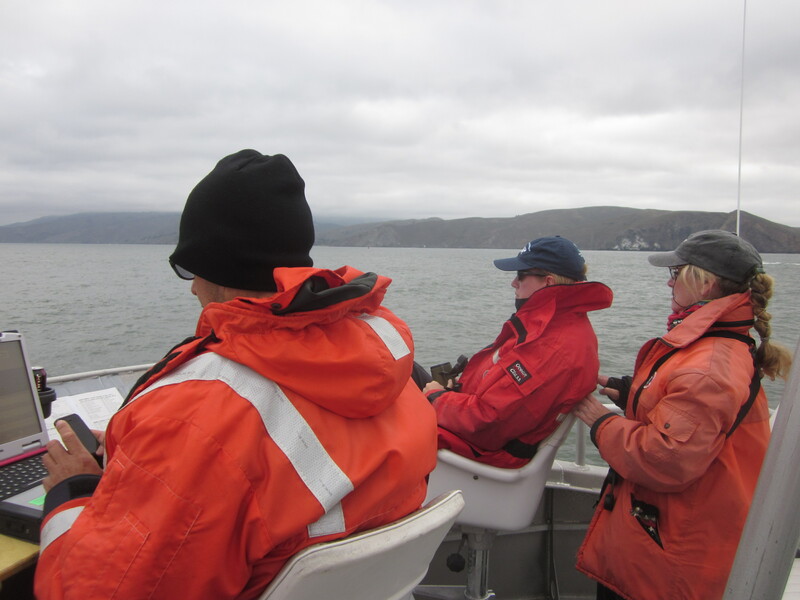 Marine mammal and seabird scientists are trained observers for this task that requires complete concentration. I interviewed them to find out more about their jobs. This long-term monitoring of the ecosystem helps shape, define and enforce the regulations for the National Marine Sanctuaries. I have the (long-term ecosystem) data when I assess damage and define restoration from oil pollution or boat grounding (incidents). If you could invent any tool to make your work more efficient and cost were no object, what would it be and why? Funding long-term data studies is a challenge, so I would like a marketing tool such as a fun TV program to market the excitement and drama of marine science. I enjoyed studying marine mammal behavior, and did a Master’s in anatomy and physiology. What part of your job did you least expect to be doing? – fundraising! The only way to keep the project sustainable was to communicate in lay terms. The Doc Ford stories by Randy Wayne White are about a marine biologist ex-CIA agent. We establish a baseline to more fully understand the effects of climate change on marine animals and thereby protect species. My work feels meaningful, I like its diversity, and I enjoy mentoring the next generation of conservation scientists. 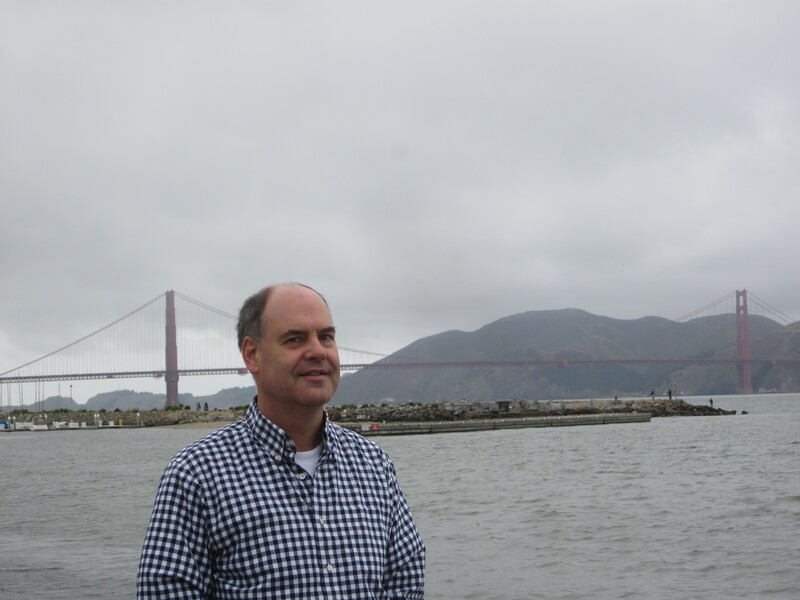 -on the Farallones Islands, on the ocean and in the office. 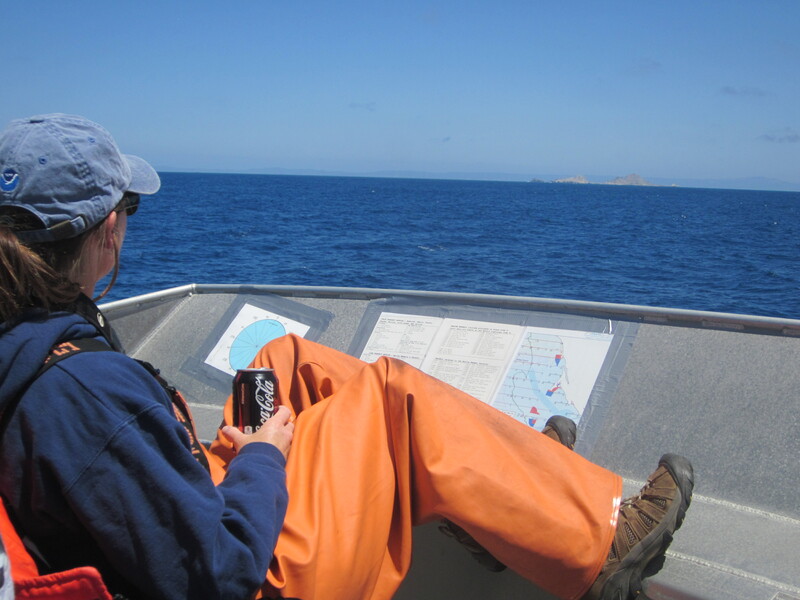 -a Leatherman, walkie-talkies and a write-in-the-rain notebook while I’m on the Farallones Islands. -a tool to see the eggs under the adult birds without disturbing them. You have to have a lot of patience as you wait for the bird to move so you can see if it’s sitting on an egg. I did not expect to be an emergency responder for freeing entangled whales. I found a field I’m passionate about and want to communicate an important message about being stewards of the environment for the next generation to enjoy. The Education of Little Tree is about Native Americans, taking care of the environment. I enjoy mountain biking, hiking and outdoor activities. Our Beach Watch and ACCESS program data informs NOAA about the effects of conditions such as oil spills on wildlife. Beach Watch is a citizen science program that extends along the California coast from Año Nuevo to Point Arena. I like being in the field and teaching and communicating why it’s important. What tool do you use in your work that you could not live without? -binoculars! How do you help wider audiences to understand and appreciate NOAA science? I teach 150 volunteers through the Beach Watch program. I like cooking and outdoor activities. Some of the field sites I’ve been are in Antarctica studying penguins, and Guadalupe Island, Mexico, and Chile. I am enjoying getting to know the scientists and crew on board. Since I am curious to find out more about what they do, I spend a lot of my free time asking questions. They are interested to know what middle school students learn in science. Every day I’m fascinated by life at sea. The fog off the California Coast is so dramatic. The other day we emerged from a huge fog bank into sunny skies where it was 15º F warmer! I mentioned the galley the other day. It still fascinates me how compact everything is here on the boat. Everyone here has a sense of humor too. Check out the shark silverware we use! How do you tell the difference between the blow (spout) of a blue whale and a humpback whale? Mission: Applied California Current Ecosystem Studies (ACCESS) is a working partnership between Cordell Bank National Marine Sanctuary, Greater Farallones National Marine Sanctuary, and Point Blue Conservation Science to survey the oceanographic conditions that influence and drive the availability of prey species (i.e., krill) to predators (i.e., marine mammals and sea birds). Hello from Sacramento, California! My name is Dana Chu and I am a Math and Science teacher and an Education Specialist at Florin High School. This year I also teach a class called Multiple Strategies for Academics and Transitions and support a Spanish 1 class. Florin High School has a diverse population of over 1,400 students that speak nineteen different languages. After school, I serve as an advisor to the Florin High School Watershed Team which is composed of students from all grade levels. I am a firm believer that providing students with the opportunity to gain first-hand experience in wildlife areas and natural habitats is the key to inspiring them to become responsible stewards of their environment, both land and water. Our school is within walking distance of several local creeks. The Cosumnes River Preserve and the Yolo Bypass Wildlife Area, both of which serve as protected habitat and crucial feeding ground for migrating birds, are a short drive away. We are also fortunate to be close to the American River where anadromous fish such as the Chinook salmon and Steelhead trout spawn. Salmon fry raised in the classroom through the Fish in the Classroom Program from Nimbus Fish Hatchery will be released there. Throughout the year, some of our students participate on field trips to these locations. I can’t wait to share my Teacher at Sea experience with all of my students, especially because the water from our local creek and rivers eventually all feed into the ocean. Students from the Watershed Team watch Sandhill Cranes fly in to roost for the evening. This field trip was made possible by the Save Our Sandhill Cranes non-profit organization. I applied for the NOAA Teacher at Sea program because I am very interested in sea turtles, ocean plastic pollution, and birds. I love being out on water whenever the opportunity arises and taking photographs of nature. I also want to learn from and directly work with scientists in the field. 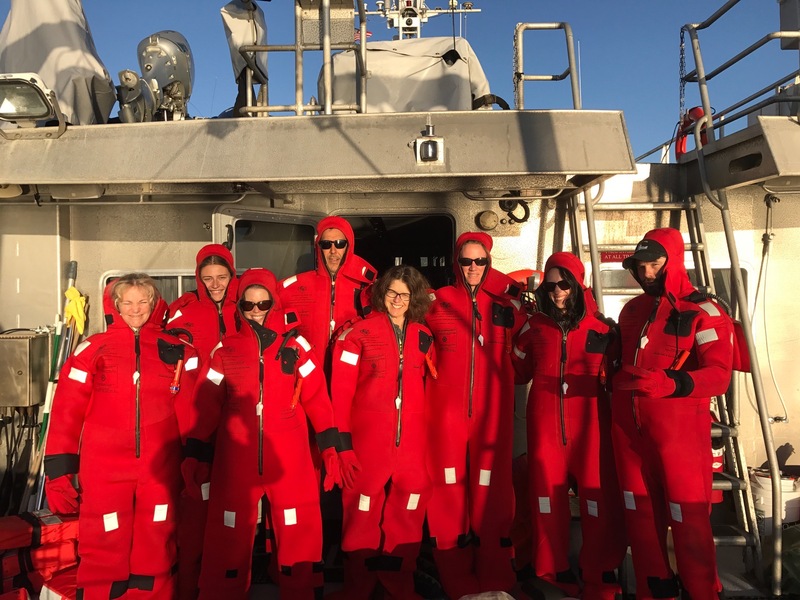 Having never traveled in the ocean for an extended period of time before, this research trip is a unique and exciting learning opportunity and chance for me to engage in many first-hand experiences. With ocean plastic pollution being a serious issue, I wonder what we will come across during the days while I am at sea. I can’t wait to sail out on the NOAA Ship Bell Shimada and to assist with scientific research in the Pacific Ocean! For more specific details on this expedition, please check the links for the Ship and the Mission. This is a photo of me kayaking in Costa Rica in 2014. In the meantime, I am in the midst of preparing for my upcoming scientific adventure. I am packing the last items needed for this research trip. At school, the 9th graders are finishing up the Water and Ocean unit with a marine animal research project. I hope to bring back relevant information to share. My 11th graders are working on their career transition portfolios and mock job interviews. I look forward to learning about the different types of scientific and marine careers available from the members of this research cruise so I can inform my students of other potential careers they might have not considered. When you hear from me next, I will have sailed out of San Francisco, California and experienced my first days of working and living at sea. I look forward to seeing the various pelagic birds plus marine mammals and invertebrates within their natural habitat. I am so excited to be part of this expedition! Weather Data from the Bridge: Wind Southeast, ten knots. Wind waves less than two feet. Swell 4-6 feet ten seconds. Patchy morning fog. We loaded the boat yesterday at 3:00 PM and I met a lot of people including the three co-principal investigators Jan Roletto of the Greater Farallones National Marine Sanctuary, Danielle Lipski of the Cordell Bank National Marine Sanctuary, and Jaime Jahncke of Point Blue Conservation Science. There are others, including volunteers and visitors, and I will try to introduce some of them in future posts. Today we didn’t collect water or plankton samples. We’ll do that tomorrow. We sailed west from the Golden Gate Bridge on a track called “Line 5” at ten knots until we passed the edge of the continental shelf and then dropped south and cruised back to our dock in Sausalito on another line called “Line 7.” Plankton and water samples are for the even-numbered lines. Our purpose today was to count seabirds, whales and seals and sea lions. It’s not simple. By 7:30 AM we are assembled on the “flying bridge” (the highest part of the boat) with Jaime and the Greater Farallones Association’s Kirsten Lindquist on the starboard side and volunteers Jason Thompson and Rudy Wallen on the port. Kirsten notes birds, focusing just on the area from dead ahead to the starboard beam and calls out things like “Common murre, zone two, thirteen, flying, bearing 330 degrees.” This means she saw thirteen common murres flying northwest together not too far from the boat. This time is called being “on effort” and she is really focused on it. I don’t talk to her unless spoken to. Jamie enters all this into a database on his laptop. The guys on the port side are doing the same thing for marine mammals and saying “Animal, by eye, bearing 320, reticle seven, traveling, immature California sea lion, one-one-one.” These last numbers are estimates of the most probable number of animals in the group, and maximum and minimum estimates. Obviously, in this example just one animal was seen. I am in awe of their ability to identify species, maturity and other things from just a glimpse. Kirsten can tell the difference between a Western gull and a California gull from hundreds of feet away, even if the gull is flying away from her. 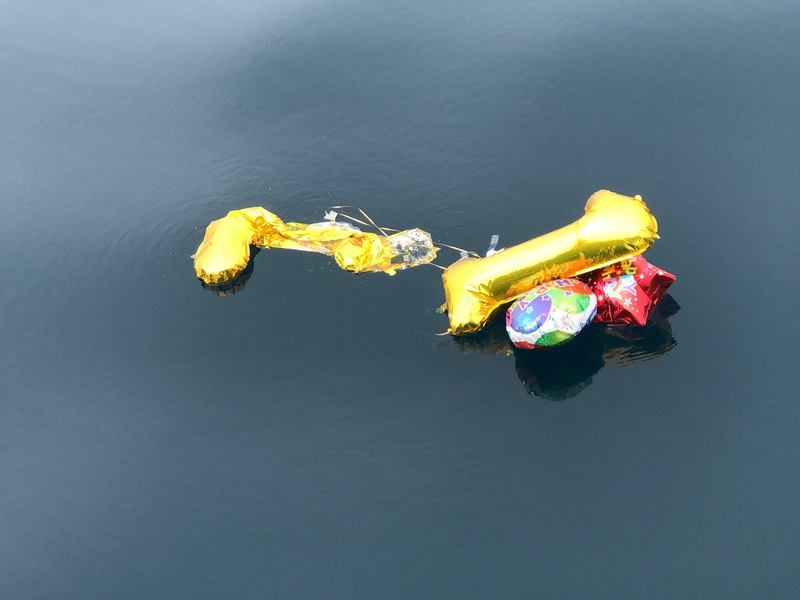 They also record floating trash, dead animals, and boats and ships. So what are we seeing? Common murres, western gulls, California gulls, Sabine’s gulls, sooty shearwaters, pink footed shearwaters, storm petrels, black footed albatrosses, red necked phalaropes, tufted puffins, Pacific white sided dolphins, northern fur seals, a bottlenose dolphin, humpback whales, a dead seal, Mola molas (ocean sunfish), one flying fish, mylar balloons (4), a paper cup, a piece of Styrofoam. The flying fish was totally unexpected because they are mostly tropical and everyone talked about it all afternoon. Some of these birds have come here from Chile, New Zealand, or Hawaii in their “off” (non-breeding) season because there is a world-class food supply here for them. The sooty shearwaters start in New Zealand and fly to Japan, to Alaskan waters, and then down the west coast of North America before returning to New Zealand across the Pacific! However, a lot of these were far away. Visually, the ocean looks pretty empty from the flying bridge. Also, you might appreciate these photos of me getting into a “Gumby suit” in under a minute, as part of my safety training. 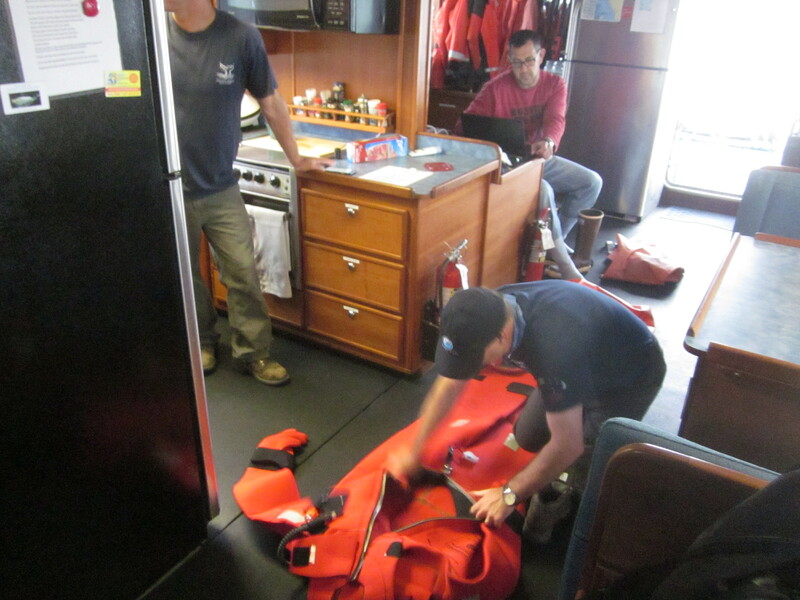 This is a survival suit meant to keep you from freezing to death if the boat sinks. You have to be able to get into it in less than a minute. Did You Know? Here’s what you need to untangle fishing nets from a frustrated humpback whale: Boathooks, sharp knives, and a GoPro digital camera on the end of a pole. The GoPro helps you study the tangles so you can decide where to make that one cut that causes the whole mess to fall apart and off the whale. If you live in the San Francisco Bay area, you’ve seen our “front yard” many times. You have looked west while driving across the Golden Gate Bridge, walked on a beach and faced into the wind, maybe even gone on a whale watching trip. How well do we know it? Besides the fog and wind, the whales and waves, what’s out there? After living here for two decades, I’m going to find out. The National Oceanic and Atmospheric Administration (NOAA) is an agency of the federal government. They’re the people who run the National Weather Service, among other things. They also do oceanographic research, and through their Teacher at Sea Program they place teachers on oceanographic ships. I am one of those fortunate teachers. I work at Sir Francis Drake High School in San Anselmo, California. Lots of NOAA Teachers at Sea get on an airplane, fly to a distant city, board a big ship and cruise hundreds of miles out to sea; but my experience will be very local. I will never be more than about fifty miles from my house, as the gull flies. In fact, Sir Francis Drake High School is the closest major school to the Cordell Bank National Marine Sanctuary, where a lot of my time will be spent. 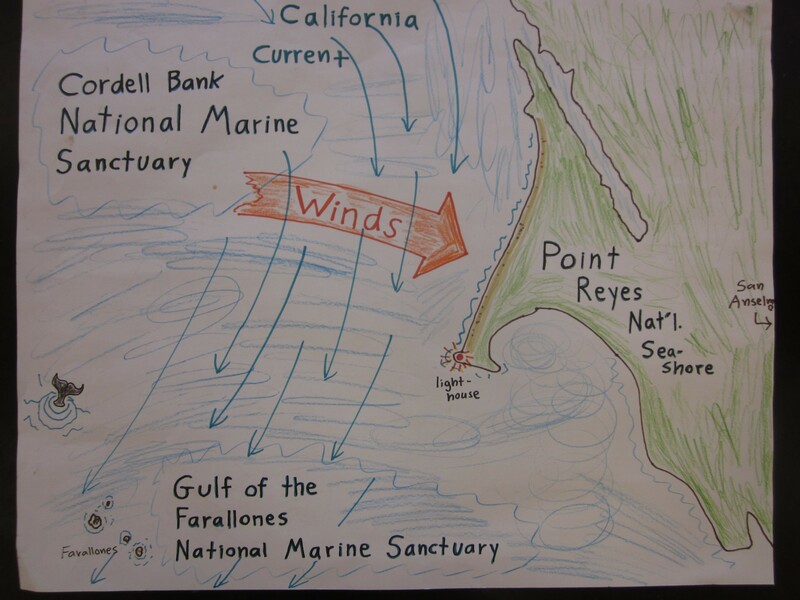 I will also be working the waters of the Gulf of the Farallones National Marine Sanctuary. A marine sanctuary is sort of like a national park that is underwater. The cruise I will be on is a routine one; part of a scientific program called the Applied California Current Ecosystem Studies Survey (ACCESS). The California Current is a cold, south-running current; part of a global circulation pattern called the North Pacific Gyre. Upwelling of deep ocean water keeps it fertile. There used to be very productive commercial fishing here, before we caught too many fish in the 20th century. There are still lots of plankton, birds, and marine mammals. The ACCESS cruises happen three or four times each year. We sample, count and/or measure seawater temperature and salinity, plankton, krill, birds and whales and other marine mammals. This way we’ll know the ecological health of our front yard. The boat I will work on is specially designed for this environment. NOAA has oceanographic vessels hundreds of feet long for offshore studies, but I will be on the R/V Fulmar, an aluminum-hulled catamaran only 67 feet long. She is technically a “small boat” and not a ship at all. She is fast and stable and six people can sleep on board, as I will. “R/V” stands for “Research Vessel.” A fulmar is a seabird that looks like a stocky gull. It spends nearly all of its life at sea. Northern Fulmars fish in the waters of the Cordell Bank and Gulf of the Farallones National Marine Sanctuaries. A catamaran is a boat with two side-by-side hulls instead of one. My jobs will include standing watches, doing science, housekeeping chores and keeping this log. What do I hope to get out of this? We do a plankton lab at my school, but it is very basic. I should be more of a plankton expert after this experience. I have been interested in the Cordell Bank National Marine Sanctuary ever since Drake High became a NOAA Ocean Guardian School last year. We picked up hundreds of pounds of marine plastic debris on the beaches of the Point Reyes National Seashore and analyzed where it comes from. 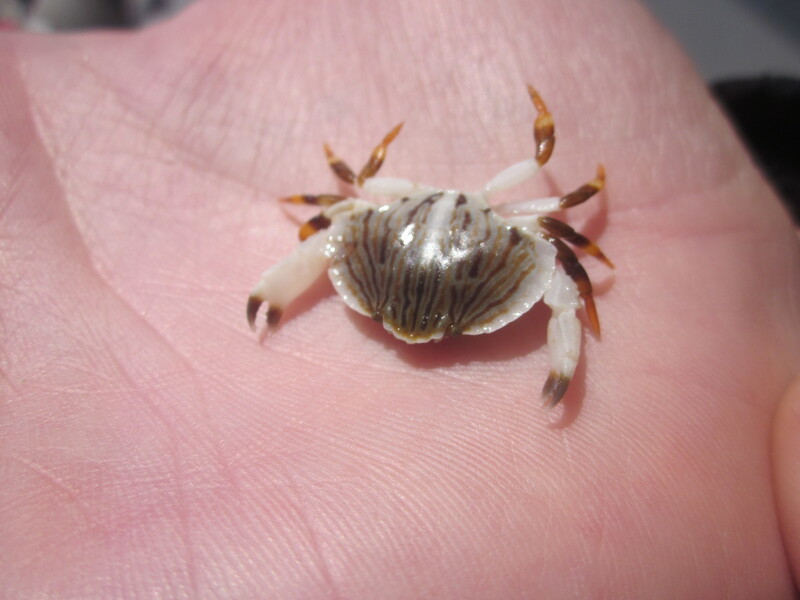 A lot of it is related to commercial crabbing and fishing and international shipping. Also, I and my students read flipper tags on northern elephant seals for the National Park Service, and our seals swim though these waters. So, I’ll keep an eye out for floating plastic and elephant seals. Really, though, I can’t yet know what this experience will lead to. Serendipity is a guiding principle for most scientists; the word implies luck, chance, surprise, and the wisdom to respond appropriately to the unexpected. It means spotting opportunities and following up on them. Since I’m so local, maybe there will be a way to get a new collaboration going with NOAA. Maybe just being in a new environment with new people will make me think outside of my daily grind. All of my best ideas have come to me while traveling. Unlike practically every other teacher in the world, I have the same students two years in a row. So if you are one of my wonderful ninth graders now, you will be one of my wonderful tenth graders when I come back from this experience. So, to my wonderful ninth graders now (and ninth-graders-to-be): Follow this blog in July! Post a comment, question, or idea. We’re going to follow up in the fall. Did you know that Sir Francis Drake missed discovering the Golden Gate and San Francisco Bay when he sailed these waters in 1579? (The “Golden Gate” is the channel of water that the bridge crosses over; there was a Golden Gate long before there was a bridge.) We shouldn’t criticize him too harshly for that because the Spanish sailed past the Golden Gate every year for 250 years without seeing it or discovering the bay! Apparently, it doesn’t look like much from out at sea.